Berkwood Resources Ltd. (TSX.V: BKR) ("Berkwood" or the "Company") is pleased to announce preliminary results of a helicopter-borne magnetic (MAG) and time-domain electromagnetic (TDEM) survey recently completed over its Lac Guéret South Graphite Property (“the Property”), in northeast Quebec. The high-resolution geophysical survey, comprising 413 linear kilometres with a line spacing of 200 metres, was performed by Prospectair Geosurveys Inc. of Gatineau, Quebec and outlined several good conductors. The results were processed and interpreted by Dubé Geoscience of Ottawa, Ontario. The survey successfully delineated an electromagnetic (EM) anomaly along a 1.8 kilometre trend, including a large circular conductive anomaly with a diameter of approximately 900 metres. Additional targets defined by the survey, within the Lac Guéret South Graphite Property, include a strong bedrock conductor, 3 km in length, situated at the Property’s northern border with Mason Graphite’s advanced Lac Guéret Property. Preliminary analysis indicates that the anomalies are likely strong bedrock conductors which have electromagnetic Z component channels response consistent with a potential graphitic source. Geophysical analysis recommends the next course of action to be follow-up ground geophysics in the form of the PhiSpy ground TDEM system to better define the conductive source positions and their extents in order to guide precision prospecting, trenching and drilling in spring and summer 2015. The newly generated exploration targets increase Berkwood’s confidence that there is significant potential to discover new mineralized zones, which could enhance the value of Berkwood’s Graphite property portfolio. Alain Berclaz, P.Geo a consultant to the Company and a Qualified Person under the definition of Canadian National Instrument 43-101, approved the technical information in this news release. To view details, maps and photos of Berkwood’s Graphite properties please click here. Berkwood has an option to earn a 100%-interest in the recently acquired 5,788 ha Lac Guéret South Graphite Property, located in northeastern Quebec. The Lac Guéret South Graphite Property borders the southern boundary of Mason Graphite’s Lac Guéret Project which has a NI 43-101 compliant mineral resource estimate with measured & indicated mineral resources of 50 million tonnes grading 15.6% Cgr (including 6.6 million tonnes grading 32.4% Cgr). 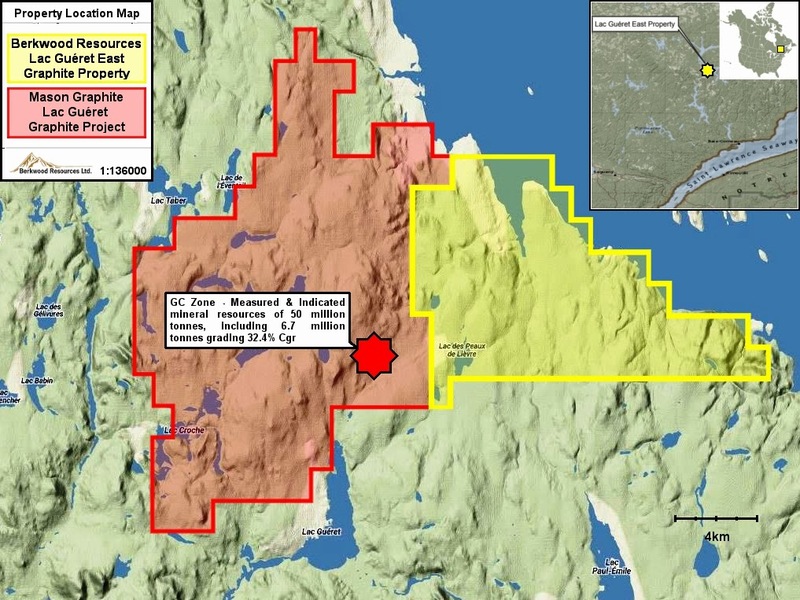 Berkwood also holds a 100% interest in the Lac Guéret East Graphite Property which is adjacent to the eastern boundary of Mason Graphite’s Lac Guéret Property. Berkwood’s Lac Guéret East and South Graphite Properties share a similar geological environment to Mason Graphite`s Lac Guéret Property including along strike stratigraphic units and structures. Berkwood also holds a 100% interest in the Prospect Valley Gold Property near Merritt, BC. Several areas of gold mineralization have been identified on the 10,871 Ha property. The majority of historic drilling has taken place in the centre of the claim block along the Discovery Trend. This drilling has outlined an extensive low grade epithermal gold system with indications of potential for additional and higher grade mineralization. The system remains open for expansion and other known zones of gold mineralization have yet to be drilled (see Berkwood news release dated January 25, 2012, for details). This Berkwood News Release contains certain "forward-looking" statements and information relating to Berkwood that are based on the beliefs of Berkwood's management as well as assumptions made by and information currently available to Berkwood's management. Such statements reflect the current risks, uncertainties and assumptions related to certain factors including, without limitation, competitive factors, general economic conditions, relationships with strategic partners, governmental regulation and supervision, seasonality, technological change, changes in industry practices, and one-time events. Should any one or more of these risks or uncertainties materialize, or should any underlying assumptions prove incorrect, actual results and forward-looking statements may vary materially from those described herein. Except as required by law, Berkwood does not assume the obligation to update any forward-looking statement. The Mason Graphite NI 43-101 mineral resource estimate was sourced from the Mason Graphite news release dated July 29, 2014. The Qualified Person has been unable to verify the information contained within the Mason Graphite news release and the mineralization on the Mason Graphite property is not necessarily indicative of the mineralization on the Company’s property.